You are here: Home / Blog / Issue / Climate Change / Is Climate Change Natural? Of course neither article claims global warming is entirely natural or entirely due to humans, but the question is whether human activity has a significant impact or not. If it does then we must change our lifestyles, if it doesn’t then we must eat drink and be merry..
For me, graphs like the one below are convincing. 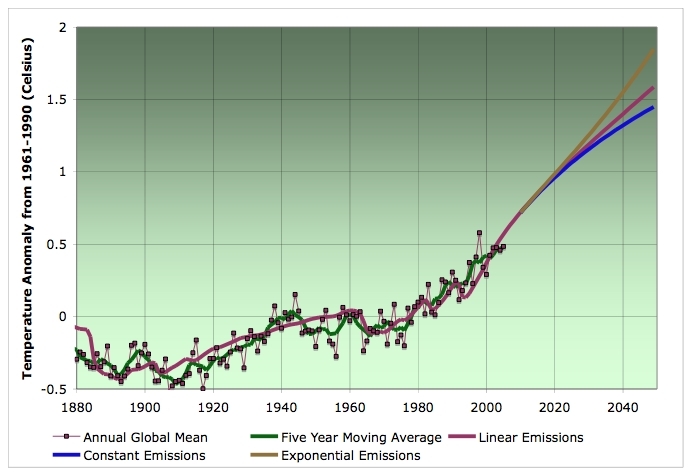 The red line appears in all three graphs and is the earth’s temperature and no one will disagree that this is rising. The first graph also shows a model in grey of natural effects on temperature, such as solar flares, in the second graph the grey line instead shows a model of solely human effects on temperature due to CO2 emissions, and in the third graph the grey line is a model combining the two. 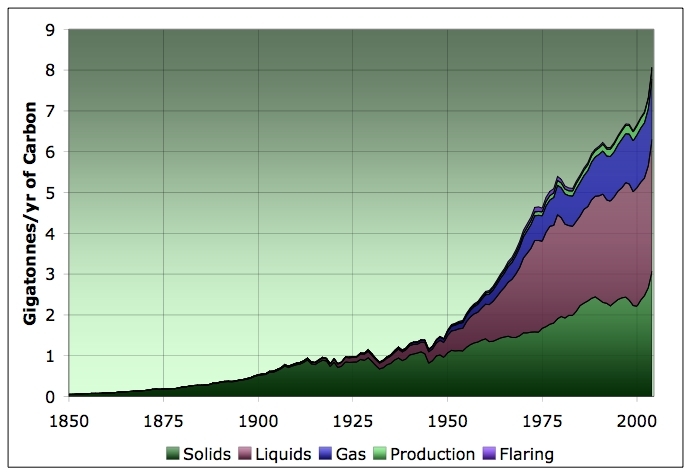 Human activity has only really caused a rise in CO2 emissions since the Industrial Revolution, as burning wood is carbon neutral, hence shown in the graph below is the effect of us in the form of solids – coal, liquids – oil and gas. https://www.earthingfaith.org/wp-content/uploads/2011/09/Secondary.png 140 470 Lesley Fellows https://www.earthingfaith.org/wp-content/uploads/2013/07/EFlogoheader3-copy-288x49.png Lesley Fellows2010-01-25 16:04:592010-01-26 16:47:10Is Climate Change Natural? The IPCC says the temperature rise in recent decades is real, beyond doubt, but as for whether it is caused by greenhouse gases, they say it is very likely, defined as 90% probability. I’m a bit cautious about comparing past variations as a way of deciding whether the present rise is natural. I prefer your last sentence. CO2 concentration is now 1/3 higher than the pre-industrial level, and that is completely unnatural. So what happened in the past is no guide to the future. Basic physics says there will be warming, the only question is how much. As a result of a letter I had published in Physics World, I have been in correspondence with a couple of sceptics. It prompted me to start on an article under a title like “climate change for non-scientists”. It’s coming along quite nicely but I’m not sure what’s the best thing to do with it.